KEYENCE Corporation of America has released the IX Series, a new Image-Based Laser Sensor. 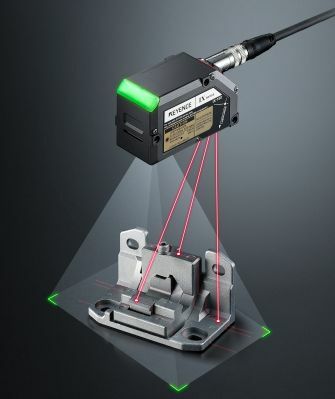 By combining a camera with a laser, users can now determine part position prior to performing laser inspection, reducing hardware and installation costs. The IX Series will retain the quick-setup simplicity for which Keyence products have become known. On the impact of KEYENCE's IX Series, Technical Marketing Manager Phil Jarzombeck said, "The IX Series will greatly simplify pass/fail inspections of components by not only allowing for target position variation but also allowing for multiple inspections to be performed at once. Upon demonstration, potential users will quickly realize how over-engineered their current inspection processes are." By identifying the target part's position and adjusting inspection accordingly, users are saved from creating mechanical solutions to orientate parts prior to inspection. Performing reference height checks with a single sensor greatly simplifies inspections that previously required multiple sensors and complex calculations. Because the IX Series is laser-based, low-contrast inspections such as height of a black component on a black background are easily determined. The IX Series is capable of inspecting multiple locations at once, saving hardware and installation costs.